South of Puerto Madryn are several highlights like the Museo Paleontologico Egido Feruglio in Trelew with stunning life-sized dinosaur exhibits, the Natural Park Cabo Dos Bahias with rich wildlife, the Monumento Natural Bosques Petrificados with its fossilized gigantic trees and the Parque Nacional Monte Leon with more than 75,000 breeding Penguin pairs in springtime and early summer. Trelew is a midsized town of about 100,000 people, located 65 km South of Puerto Madryn. Its origin is Welsh and its name is a homage to Lewis Jones, who promoted railway expansion in the province Chubut: tre - town and lew - Lewis. We arrived in Trelew in the late afternoon of October 26th 2011 and spent the night on the shore of the Parque Recreativo Laguna Cacique Chiquichano, close to the planetarium. 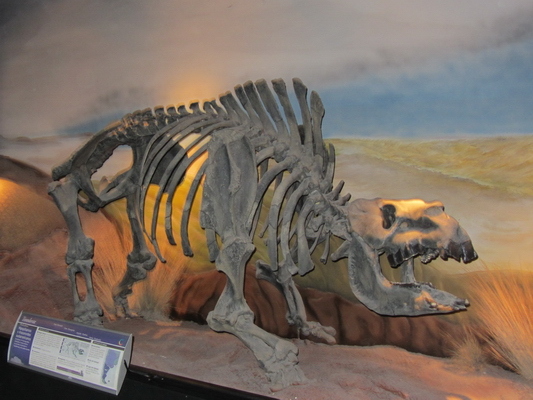 Trelew is famous for its outstanding natural-history museum Museo Paleontologico Egido Feruglio with more than 1700 fossils. It is the paleontological center in Patagonia with the university of Trelew. The explanations are very good and both in Spanish and English. It provides an overview about the geological time-line and its impact to nature with international posters. Close to Trelew is the little welsh village Gaiman, which is famous for cream pies, cakes and black tea. There are many expensive tea houses to enjoy these goodies but also bakeries with more reasonable prices. Inspired by the Geocache Tesoro Ameghino we made a deviation to the main street of Patagonia, the RN3, of approx. 100km westward to the artificial lake Embalse Florentino Ameghino. The Rio Chubut is dammed in a narrow gorge close to Dique Florentino Ameghino. The lake has several arms and is more than 100km long. We were the first founders of this Geocache and we exchanged a trinket to a blueberry tea bag. Marion loves blueberries. The tea tasted wonderful, thanks kariher (the originator of this Geocache). The landscape is marvelous with rocky walls and pinnacles. We made another deviation to the coast, because we were inspired by the Lonely Planet that Camarones is the sleepiest coastal village in Patagonia. It is a picturesque little fishing village. South of Camarones on the way to the Natural Park Cabo Dos Bahias are free campgrounds directly on the beach. We found a wonderful, peaceful and remote spot (GPS coordinates S44°52.694' W65°41.304'). Cabo Dos Bahia has a huge colony of nesting Penguins between October and March. Other wildlife include different birds like Cormorants, Guanacos, Rheas, Foxes and Sea Lions. It is a short hike to the Penguins of about half an hour. The cape of natural park can be reached by car. It is a nice opportunity for walking in a rocky environment and to see other animals like Guanacos or Sea Lions. 200km Southwest of Camarones is the largest town of Argentine Patagonia: Comodoro Rivadavia with approx. 140,000 inhabitants. It is a booming oil city and it supplies Argentina with oil more or less. It was Sunday afternoon when we drove through Comodoro Rivadavia. We had fuel less than a quarter; consequently we intended to fill up our tank. Strangely there were long rows of cars in front of the gas stations. Our car consumes diesel and at every gas station we saw red tapes in front of the diesel pumps or we got the message No hay diesel - We don't have diesel. We continued to the next town Caleta Olivia in the hope to get diesel on Monday morning. But we had to wait till 2:00PM. Welcome to the oil country! 50km West of the RN3 is the marvelous park Monumento Natural Bosques Petrificados. There is the remote campground in the ranch La Paloma half the way. When we arrived there just a dog greeted us. We needed a walk after long driving; so we explored the environment of La Paloma together. When we returned we were still alone. Finally an elderly man came out of a house named tienda - shop and firstly he was astonished to see us. It turned out that he had slept the whole afternoon, because he had driven to Comodoro Rivadavia in the early morning and back at lunch time - more than 400km! Secondly he was happy to see us and offered us a beer. He told us a lot about La Paloma, Argentina, Patagonia in a mixture English and Spanish. We had a lot of fun. The park is outstanding in an incredibly nice environment. To see 150 million years old fossilized tree trunks is an overwhelming experience. There is a 2 hours walk along the fossilized trees to a Mirador - viewpoint. Close to the southern end of Patagonia's Atlantic coast is the superb Parque Nacional Monte Leon which protects 40 km dramatic coast line and 600 sq km Patagonian steppe. It is named after the shape of a rock which reminds on a resting Lion - Monte Leon. This region suffered a lot in the past due to hunting of Sea Lions and extraction of guano until the 1970s. Still some remains are visible like the iron ropes of the bridge to the Isla Monte Leon, which is today inaccessibly, because thousands of birds are nestling there. We arrived in the late evening at the only campground Kimiri on the beach and had some beer with Stefan from Hamburg and the owners Alicia and David. They told us a lot about life in Argentina and southern Patagonia, it was very interesting - Thanks a lot Alicia and David. Next morning we explored the wild but beautiful and remote beach North of the campground. There is a short trail to the shoulder of the Lion where you have an outstanding view to the coast, a colony of Sea Lions and a lot of birds. Monte Leon is famous for its nesting Magellanic Penguins. There is a 1.5 hours walk to the colony of more than 75,000 couples through the Patagonian steppe. Suddenly we saw a strange warning board. Indeed soon we realized interesting footprints on the trail. Suddenly we were in the Penguins, untold thousands. In the late evening we found a remote spot outside of the national park. But we were not totally alone. fantastisch, wahrscheinlich fliege ich bis Buenos Aires, mit den Bus mit einigen Unterbrechungen bis Ushuaia, und von da langsam Richtung Santiago und zurück nach Wien - leider.